Discovering new and interesting blogs is what giving and receiving blogging awards is all about. Todays post reveals 4 more awards that I have received, a total of 26 links to blogs you may want to visit, and a video that is awesome! If anyone is counting (and I am! ), these are my fourth, fifth, and sixth and seventh awards! I am the proud recipient of the WordPress Family Award, the Super Sweet Blogging Award, and the Best Moment Award. I have combined them all into one post, for simplicity’s sake. If you want to check out some new blogs, take a look at the blogs that I have nominated as well as the blogs of the people who have nominated me. Read the whole post, too, so you can learn a few more things about me…if you want! I already told you a few things when I received The Liebster Award, The Very Inspiring Blogger Award, and The Shine On Award, but in case you missed those posts, you can read them now! The awards I have been nominated for are The WordPress Family Award, The Super Sweet Blogging Award, The Best Moment Award, and The Unique Leaves Award. I am accepting these awards simultaneously in today’s post. I have to thank Barb at My Un-Puzzled Heart (Barb’s blog is no longer active) for this award and The Unique Leaves Award. 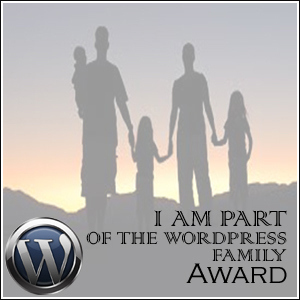 This award recognizes me as part of the WordPress family! I am touched by the outpouring of awards I have been getting lately, and think that it’s a great gesture when people share these. Unlike some people who think that they are “above” accepting such an award, I am honoured that others have included me in their participation. There doesn’t seem to be any rules for this award, either, except to nominate ten people who have WordPress blogs and notify them of their nomination, so here is my list of ten bloggers on WordPress who will hopefully accept their award as graciously as I have accepted mine. Okay, I know it says to list 10, but the above 9 blogs are blogs I just found using my WordPress Reader, and while it’s true they are users of this platform, I don’t know any of them…yet. The people I do know, however, whom I hope will accept this award are those whom have commented on this blog recently and whom I have decided to recognize by nominating them for this award, and the two others for which I have been nominated. For the Super Sweet Blogging Award, I have to thank Kamalika Jayathilaka from Rhymes Ablaze. Thank the Super Sweet Blogger that awarded you. Answer five Super Sweet questions. Notify your nominees on their blog. 4. What is the sweetest thing anyone has ever done for you? 5. What is your sweetest memory? Cookies, cakes, cupcakes, cheesecake, ice cream, and anything else! Ha! Chocolate. Definitely chocolate. This is my favourite of all sweets, and always will be! The sweetest thing anyone has done for me is write me a song. This is the first thing that came to my mind, even though others have done nice things for me over the years.Tied with this would have to be the actions of Mr. Guy Davis, who was a math teacher at the Adult Education Center where I completed my high school education. Mr. Davis got ahold of a textbook from one of the local high schools and put together lessons for me to do, as well as midterm and final exams, for a math class I needed as part of my program requirements for university entrance. He went out of his way to do this, and it was probably the most meaningful thing that a total stranger has ever done for me! He told me that he recognized a raw talent in me, and wanted me to have the opportunity to get into the program of my choice (which, ironically, was teaching!) and so he spent hours upon hours going the extra few miles for me. For this, I will never forget him. The Girl from The Reporter and The Girl, who also should remind me of her name…. Thanks goes out to Barb (aka Bee), as aforementioned, at My Un-Puzzled Heart for The Unique Leaves Award. Even though she did not post the rules on her blog, I did a search the rules and found them on a few blogs. Tell us how unique you are and your blog. What are your thoughts about being unique? Nominate 10 others blogger for this award and link to them. Notify those bloggers for the nomination. My blog is unique because it is a compilation of my life’s experiences, both bad and good, and from my experiences, I teach others what I have learned. Since I am an avid reader and a writer who wants to publish several books, I have taken an interest in the publishing world. This has resulted in making connections with several writers and authors who have taught me many things about this industry. I have conducted interviews, gotten advice, and have had guest posts written for Lorraine Reguly’s Life during the past few months. For a complete list of posts, you can visit my Post List page, and read the titles of the posts in the urls/links posted there. I added this page because sometimes it is easier to look up a post this way rather than by searching the archives. I have a motto that demonstrates my thoughts about being unique: “Dare to be different”. I think that if more people were to follow this motto, we would have less competition, be less jealous or envious of others, have less fear, and enjoy life more. Expressing ourselves is something we should be encouraged to do, in whatever way we feel most comfortable with, whether it be through music, writing, speaking, wearing certain colours or articles of clothing, whatever. Anything goes. Happiness is tough to come by in this world, and if you can find peacefulness and contentment, and be happy in your own skin by expressing yourself in a unique way, then that’s absolutely wonderful! Daring to be different is a very good thing, in my opinion. Being unique is what makes us interesting to one another. Even though we are human and have similarities and basic needs, and even look the same (basically), our minds are shaped by so many genetic and environmental factors that no two people are identical, not even identical twins! (Or triplets, or…you get the point…) Being different causes us to be fascinating. Have you ever played the “sometimes I wish” game? It’s fun to imagine what life is like for other people! However, being happy with yourself is more important than wanting to be or pretending to be something you are not. Inner happiness and peace cannot be achieved by coveting what other people have, or what you perceive they have. It can only be found within yourself, and no one is exactly like you! Be happy you are unique, be happy to be yourself. Dare to be different! I do, and for the first time in my life, I am happier than I have been in a long time. Of course, I am also doing the things I love now, in this chapter of my life. Yes, my life, like a book, can be broken down into chapters. I am done with the negative ones, I have had positive ones, and this year, in January, I embarked upon a new chapter, one which focuses on my “writing” career. I have already written a non-fiction book, I have plans to write either an autobiography or a book of memoirs, I am starting to put an ebook together and, depending on how that goes, maybe a few more, and I have a mystery novel inside me that wants to be written. I also want to write another nonfiction, historical book on the apartment building called Winston Hall that was located across the street from the house in which I grew up, which used to be the old army barracks at one point, housed workers for an industrial plant across the street, had a lobby that doubled as a ballroom, was equipped with a bowling alley and a concession stand that later became a convenience store (which my mother owned from 1982 to about 1995), and which my grandparents lived in from 1955 or so to about 1995 – I still have to check the exact dates). This building, Winston Hall, burned down in 1986 or 1987 (again, I have to check the exact dates). So, as you can see, I have a lot on my plate! My nominees for this award are the same as those listed for the Super Sweet Blogging Award. I have to thank Raani York for this award. Raani writes about a few things on her blog, but mainly she writes from the viewpoint of her two cats, Jake and Charlet. She is unique, and I love her for it! Winners re-post this completely with their acceptance speech. This could be written or video-recorded. Winners have the privilege of awarding the next awardees! The re-post should include a NEW set of people/blogs worthy of the award; and winners notify them of the great news. Also, don’t forget to thank the blogger who nominated you! The source: What makes a good acceptance speech? – Gratitude – Thank the people who helped you along the way. – Humor – Keep us entertained and smiling. – Inspiration – Make your story touch our lives. Thank you very much for recognizing my blog by bestowing this award upon it! I am touched that you would consider me for such an award! To my readers, and to whomever lands on this site, I am grateful for your time, your comments, and your engagement with other bloggers in the blogosphere. We form a community of people who have learned what it takes to run a blog, providing you with entertainment and information that you need or want. Blogging is not easy, sometimes, and bloggers work hard to do their jobs properly! I think I can speak for all of us when I say that we hope to provide you with many more memorable moments in the future! In doing a search for more information about this award, I came across a website I had never before heard of, which is Melissa Janda’s The Buzz on Writing, and watched a video she made. I absolutely loved it, and have included it here to share with you! Please watch and listen to it; it is amazing, and echoes so many of my feelings and sentiments! Since there is no set number of people to nominate, I would like to nominate anyone who is on my above two lists of nominees who has not yet been nominated for this award and wants it! 4. When your post has been published, copy its url and go to the site of the first person on your list. Leave a comment for that person, saying “I have nominated you for a blogging award, which you can read about and accept here:” and then paste your url into the comment. BUT Before hitting “publish comment”, copy the entire comment (so that you don’t have to re-write the whole thing over and over) and then visit each of your other nominees and notify them by commenting on their sites simply by pasting your “copied” comment. 5. If you have a computer mouse that has a “wheel” on it, pushing down on the wheel will open each link in a new tab. What I do is open each of my nominees’ links in a new tab/window on my computer and then, once I have notified them of their award, I simply close the tab. When all tabs are closed, I know my work is done! I hope these instructional tips help! Even though you are a new blogger, you should read Are You A “Pro” Blogger Yet? 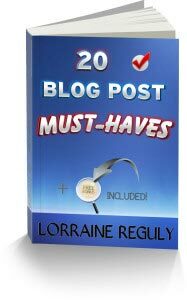 Use 20 Blog Post Must-Haves and Become One! I’d advise then reading my guest post on Dear Blogger, where some more free tips are revealed. I always see those little awards down on the bottom or on the side, and I am impressed. Now I know from whence they come. Thanks for the advice. I like blogging awards, though for my last award post, I accepted five and only passed on one. It’s nice to be recognized, and it’s fun to read about bloggers and pass on awards to others, but I think it’s also necessary to note the awards don’t come with any strings attached. I’ve nominated some blogs knowing the bloggers do do those types of posts. Plus, if a blogger if really busy they may not have time to reciprocate by doing the post. Sometimes, the issue gets a little too personal. It’s all in good, light-hearted fun. DEAR HEART, Lorraine Marie Reguly, I am MaryHelen Ferris, my wee blog is greatpoetrymhf.wordpress.com. I am honoured for the nomination(s). HOWEVER, I am 70 years old…having extreme health challenges and would like very much to reply to this GENEROUS nomination at a later date. Please advise should this not be satisfactory to your award system. For details, regarding the health challenges…I will share that information when the timing is better and I do not have so many family in attendance. Most of my blood family do not read my blog except the week of my birthday which this is. In the interim, thank you EVER SO MUCH for your generousity of Spirit and EXTREME kindness. YOUR TIMING IS PERFECT for me. I am thrilled that you are 70 and blogging! Way to go! Good for you! Enjoy your time with your family, and “happy birthday” from me to you! Watch for an email from me, Melissa. Thanks, Ms. Vee! I can’t wait to read it! I will do my best to follow the rules. I am going to combine all award appreciations in one post. Thank you! Looking forward to checking out the blogs you mentioned. 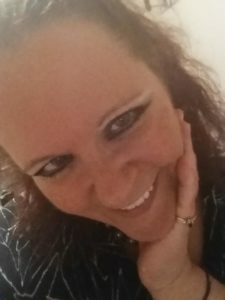 Thank you Lorraine … and I invite your readers to stop by as I’m an interactive host. Hint: start it and save it as a draft, then go back to it when you have time. If you like, you can schedule your post to be published on a certain date, too. Or do you know about scheduling already? A hint: when choosing your nominees, if you find that you have too many to nominate, keep a folder in your bookmarks for “blogs to be nominated” so that, if in the future, you are nominated for more awards, you will have a list of blogs at the ready! Wow! Am I reading this correctly? You nominated me for two of the three awards you were nominated for? If this is true, and I think it is, THANK YOU!! I was nominated for a Liebster Award as well. That is a bunch of questions to answer, nominations to bee done. This is my second Liebster. I hope it goes better than the first. Yes, you can accept whatever awards you want, Cathy! These awards are a great way for bloggers to get to know one another, and for our blogs to be exposed to other people! Congrats Lorraine. You deserve it. Way to go and thanks for the award back! I think awards are great for people who may doubt their talents and need that feedback. It’s always great to be recognized by one’s peers! It certainly is, Christy. Everyone needs recognition every now and then! We all doubt ourselves; we would be inhuman if we didn’t. The key is to stay strong, remain focused, and work toward your goals. 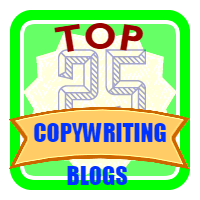 What a great list of blogs, many of which I have not seen, so it’s a chance to discover some new bloggers. A big thanks to you for nominating me for the Super Sweet and WordPress and a BIG congrats to you on winning the WordPress, Unique Leaves, Best Moment and Super Sweet Blogging Award!!! Send some of that heat here, please! Thank you Lorraine – it is a great feeling to have someone nominate your blog for an award, I am a’blogging award virgin’ so to speak so it does feel a little daunting. I do think it is a great way to get your blog out there for us newbies to WordPress, I have been blogging for a year on Blogger but the WordPress community is so different and responsive, bloggers actually care and show appreciation – it so welcoming and encouraging – so you made my day! Thank you. I am so happy for you! I was really excited to get my first award, too (the Liebster award). If you’re interested, you can read it (find the link on my Post List page). I actually did a lot of research for it, and for award “memes” in general, so if this is your first, I’d recommend perusing it. I think awards are important, because 1) they show people are interested in what you have to say and 2) your blogs stand out as teaching tools to help other people.overcome problems,inspire others to do better, or educate on certain topics. I agree with you!!! Congrats, Jo Ann!